I have been happy and cheerful in these blogs, mostly because I have no idea what I am doing, but now I feel deep down inside like complaining. The complaints this week are about Rudbeckia. It could be worse. We started out growing perennials back when perennials were just being discovered. 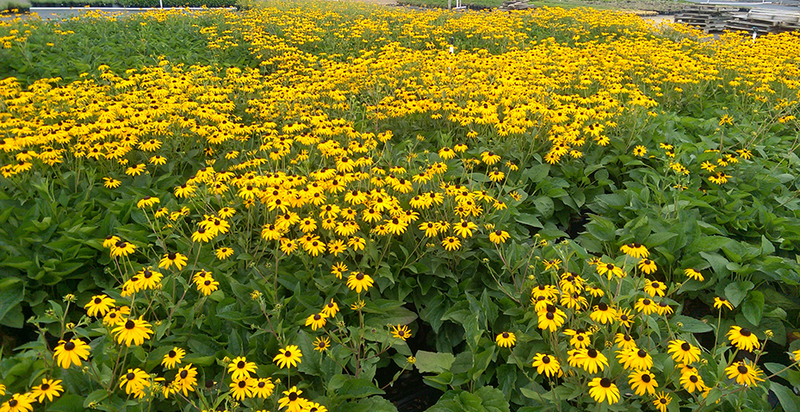 Bluestone Perennials over in Lake County, Ohio started to sell 72 cell liners. In Chicago both T & Z and Natural Gardens were positioned to be in the perennial container business. They were positioned because they were there and not because they were ready. The intensity of demand was astounding and as a result small 2×4 framed and plastic covered potting stations were set up on hillsides and things were potted up and sold long before they were ready. The standard perennials were seed-grown varieties—Echinacea Magnus and Rudbeckia Goldsturm and Shasta Daisies—because this was before the German people figured out how to take our native prairie plants—such as achilleas and liatris and Little Bluestems and make them pretty. And then Oehme van Sweden invented the Great American Garden where great swaths of Rudbeckia Goldstrum were strewn about promiscuously. Years ago someone told me that Rudbeckia fulgida ‘Summerblaze’ was improved and so we went into it in a big way and then got out of it about when the demand picked up and now we are back in. This plant propagates true-to-name from division and we have figured out how to greatly over-produce it by digging in the fall and winter dividing. We told everybody that this bloomed longer, was shorter, and not as susceptible to Septoria leaf spot, a fungal infection that causes unsightly leaf spots. Goldsturm is particularly prone to this problem. We do not know anything from personal empirical experience, but we are good at repeating things. 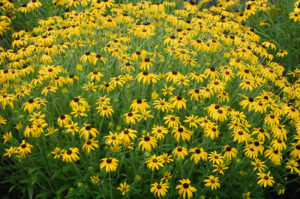 And then everyone wanted Rudbeckia fulgida var. speciosa ‘Viette’s Little Suzy’ and it was a patented plant so we paid the money to buy in liners in order to satisfy the market. When we figured out that it was going off patent a year or so ago we geared up for lots of field production under the optimistic and misguided assumption, presumption even, that demand would continue. And then some German guy invented Rudbeckia var. sullivantii ‘Little Goldstar’ PP# 22,397 that everyone now wants instead of ‘Little Suzy’ and I am going to be an old man before that goes off patent. Life is not fair. We will be offering this to meet market demand buying in the liners and paying the royalty fee all legal and above board. 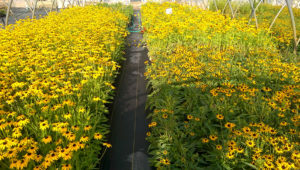 Because hope springs eternal we are starting up big time going into production of two of Brent Horvath’s Intrinsic Perennial Gardens’ new rudbeckias. We are patent licensees with Intrinsic and like doing business with him. We have done business with Brent for years and before him for his father. Back when I worked for a living and did not sit around pounding out blogs and newsletters all of the time I used to drive the truck and deliver to the original Intrinsic Gardens. 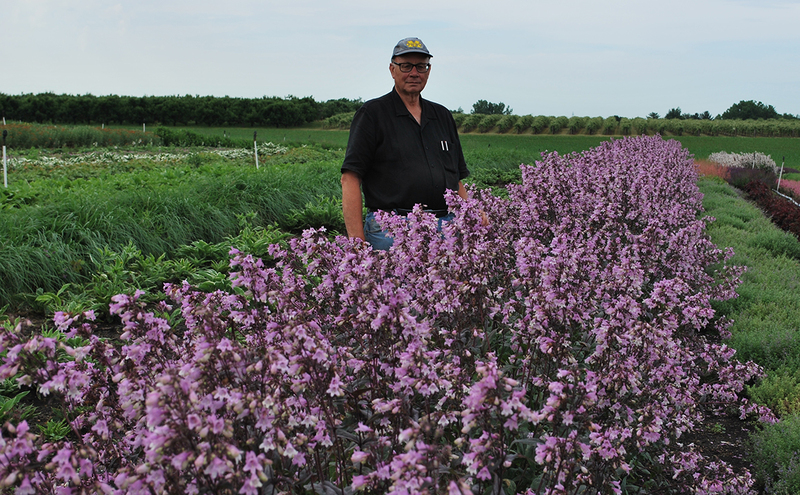 We are assuming—presuming again—that if Brent goes to all of the work to breed and patent a plant that it must be good and will soon be in hot demand and that we will want to offer all of his introductions because we want to be an up-to-date first-class innovative nursery. The new introductions are: Rudbeckia ‘American Gold Rush’ PP#28,498 that Walters Gardens says is good because the thinner harrier leaves make it disease resistant and, best of all, that it is: “Destined to be a new staple for landscapes!” I had to quote the Walters’ catalog because I wanted to get the exclamation point in there and I refuse to use one of those things no matter what in my own writing but it is ok ideologically if I quote someone else. 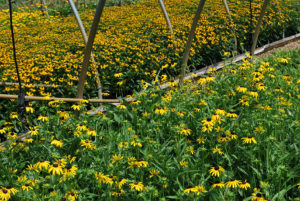 The other introduction is: Rudbeckia ‘Glitters Like gold’ PPAF and it is described as having: “more bloom, greater bloom volume, and more disease resistance”. It does not get any better than that. I see that I did not believe Brent when he told me two years ago about how great his rudbeckias were and now a lot of other people have gotten on that band wagon so we are a little behind. I need to learn who to believe and who not to believe. We are growing Brent’s Penstemon d. ‘Pocahontas’ PP# 24,804 which is a great plant and significantly improved—more bigger and more blooms and more color—over regular ‘Husker Red’. I believe that if Brent would do more promotion and advertising then we would sell more ‘Pocahontas’.